Eucalyptus magnificata is known as the Blue Box and is a tree that will reach a height of 15 metres. The bark is pale grey, fibrous and flaky. The leaves are oval and five to ten centimetres long by four to six centimetres wide. They are bluish-green in colour. The foliage of Blue Box is an attractive feature. The buds are club-shaped and usually appear in groups of seven. Flowers are white to cream, 1.5 centimetres across and are both conspicuous and profuse during the flowering period in November and December. Blooms are followed by distinctive club-shaped gum nuts. Eucalyptus magnificata was split from E. baueriana in the early 1990’s. The latter species is found in coastal southern New South Wales and Northern Victoria. 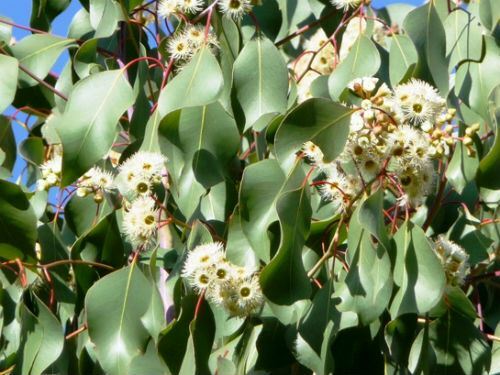 Eucalyptus magnificata is classified as endangered and is found in three small populations, two east of Armidale, NSW and one in southern Queensland. The Blue Box could be grown as a specimen tree in larger suburban gardens or as a component of shelterbelts and windbreaks on rural properties. The leaves are used for dyeing wool and yield a red colour.